Dr. Martin Luther King, Jr. was a courageous minister and civil rights leader who died 50 years ago and whose birthday we celebrate today. He raised the consciousness of our nation through his impassioned speaking and writing. He spoke with tremendous personal courageto a watching world about a Christian vision of equality, justice, and human dignity. His leadership and ministry changed the course of history and cost him his life. On this special day commemorating his life and legacy, let us pause and consider how far we still have to go to see the dream of racial justice fulfilled and gospel unity in our own congregations realized. As Dr. King said, "One of the great agonies of life is that we are constantly trying to finish that which is unfinishable." But may our commitment be renewed this day to the truth that every human being—regardless of ethnicity, nationality, economic status, or intellect—has been created in the image of God and should be treated with dignity and respect. Being committed to that truth requires action that is costly. 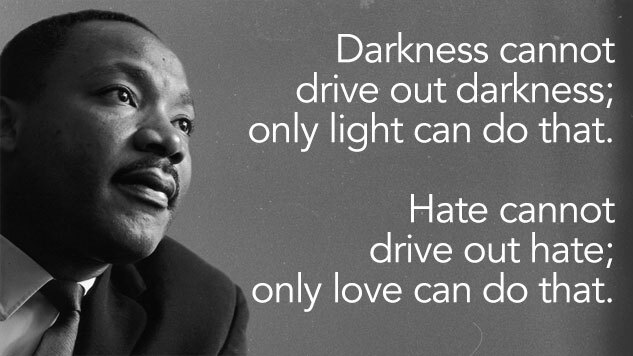 It doesn't entail merely reposting great quotes by Dr. King (even though there are so many!) once a year. It requires daily intention and commitment and perhaps even courage. Each of us must take the initiative to get to know people who are different from us, appreciate their heritage, and value their contributions. We must take a stand when others face discrimination or injustice. We must repulse hate-filled speech, (even when it is not directed at us). We must acknowledge and fight systemic injustice that keeps our brothers and sisters around the world and across the street from enjoying freedom, safety, and growth. As Dr. King said, "On the one hand we are called to play the good Samaritan on life's roadside; but that will be only an initial act. One day we must come to see that the whole Jericho road must be transformed so that men and women will not be constantly beaten and robbed as they make their journey on life's highway." Church, let us rise up, not just on this day, but every day to work toward racial reconciliation and love for one another. May we be a reflection of the heart of God for all His children.